A Northampton based technology company is claiming to offer the world's first 100 per cent spam blocking guarantee for home computers and businesses. ClearMyMail has been in testing for the last 12 months and already has users from 100 countries. The new service stops all forms of rogue emails using its own anti-spam filtering processes and its success so far has already attracted venture capital funding during the testing process. 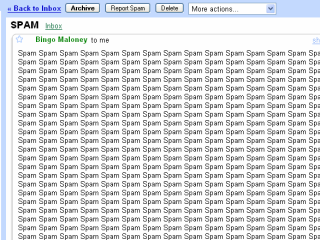 The system has the ability to also stop the new wave of image-spam that has been increasingly hitting email in-boxes. "This is an exciting time for all involved with ClearMyMail and is the fruits of several years' hard labour. I firmly believe that domestic and small business users of email are neglected when it comes to preventing spam and this is a gap we aim to fill," said Dan Field, managing director of ClearMyMail. "Our year long rigorous testing makes me supremely confident that not one rogue email is going to slip through our network and as the spammers find more intelligent ways of sending their mails we will be there to keep stopping them". ClearMyMail uses an 18-stage anti-spam and anti-virus filter system to ensure that not one spam email gets through. There is a free 30 day trial and then complete email peace of mind comes at a price of £15 for 6 months, £24 for a year or two years for £40. The announcement comes on the same day that a survey by Nucleus Research and KnowledgeStorm suggested that nine out of ten e-mail users are frustrated with spam, and that the distraction it causes at work costs US businesses $712 (£360) per head every year in lost productivity.